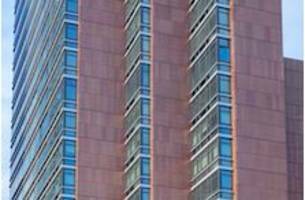 Wausau, Wisconsin (June 2018) – Opened this spring, The Forge, a 272-unit luxury residential tower in Long Island, New York, features a façade of copper-colored anodized aluminum cladding. Designed by FXCollaborative, its distinctive, artistically inspired, industrial-influenced, exterior is composed of Dri-Design’s aluminum wall panel system finished by Linetec. The project is pursuing LEED® Silver certification. Developed as a “village in a building” by Brause Realty Inc. and Gotham Organization, the wedge-shaped site and stringent zoning requirements led The Forge to take a slender form with stepped massing in a neo-modernist style. While it is a single 38-story, 266,000-square-foot structure, the property appears as if it could be three separate wafer-like buildings set side by side with a fourth, far shorter, one nestled at the foot of the other three. On the south elevation, where the dominant street grid meets the elevated Thomson Avenue, the building’s thin slabs are stacked and angled to follow the diagonal avenue. Each of the south elevation’s slabs measures no more than 20 feet wide and stretches to the pinnacle uninterrupted by openings. The other elevations also showcase the copper-anodized cladding punctuated by julienne strips of windows to maximize daylight and views toward the East River and Manhattan, all while preserving outdoor zones. It is on The Forge’s south side that the copper-colored aluminum wall system clads the entire height of the building, accentuating its vertical presence. To create the industrial metallic look specified by FXCollaborative, Linetec finished more than 92,000 square feet of Dri-Design panels in a proprietary copper color anodize and painted an additional 4,800 square feet in a Black Iron color. Linetec’s proprietary and warrantied finish is accomplished through a three-step electrolytic coloring method, rather than the standard two-step process. The resulting finish remains a bright copper color, with no patina over time. It does not require a clear coat or ongoing treatment to maintain color stability. It is available for extrusion, stretch-formed and flat sheet aluminum, before or after assembly. Supporting The Forge’s healthy, sustainable goals and LEED criteria, Linetec’s anodized services produce no harmful or dangerous by-products and is non-hazardous. Anodized aluminum is an inert, non-combustible material that is 100 percent recyclable and poses no health risks. At the beginning of the new millennium, Linetec and other environmentally responsible finishers, changed from the traditional caustic etching process to a more eco-friendly etch system. Compared with conventional etch processes, this improved anodize process reduces landfill waste by 75-80 percent. Landfill waste directly relates to the production of greenhouse gas. This change to eco-friendly anodize also made it easier for customers to use secondary (recycled) billet in the anodize process. The Forge’s aluminum wall system is manufactured with recycled content and, at the end of its useful life as exterior cladding, is 100 percent recyclable. Further contributing to The Forge’s long life cycle and minimal maintenance, anodize aluminum resists the ravages of time, temperature, corrosion, humidity and warping. Its copper anodize finish meet the American Architectural Manufacturers Association’s AAMA 611 Class I Specification. Protecting and maintaining the structural integrity of the aluminum, it retains exceptional hardness and lasting durability. To arrive at the enduring look of The Forge’s copper-anodized wall system, Dri-Design and FXCollaborative first began discussing the building’s design in 2013 during the earliest stages of the project’s conception. He proudly notes that the two companies have a long-standing relationship and “the use of Dri-Design was a first choice based on many qualities.” Among these qualities, Dri-Design’s architectural metal wall cladding system is made form one single solid piece of aluminum; it is not a metal or aluminum composite material. Because it is not a composite material and is not laminated, the panels will not delaminate. Engineered as a pressure-equalized rain-screen system, Dri-Design’s wall panel system complies with the National Fire Protection Association’s NFPA 285 standard. It also has passed the most stringent air, water and structural testing requirements in the industry, including AAMA 508 test protocol, as well as Miami Dade County’s hurricane testing. “With the performance requirements along with the desired overall aesthetic of the façade, Dri-Design made the most sense,” summarizes Fowler. Dri-Design’s rain-screen wall system attaches to nearly any substrate without the use of clips or extrusions. This quick-connecting, interlocking panel design helped installing contractor KNS Building Restoration stay on schedule. KNS worked closely with general contractor Purves Street Development following The Forge’s start of construction in June 2015. In August 2016, the project “topped out.” The building was substantially completed, on time, in the summer of 2017. As a recognized part of The Forge’s success, residents enjoy 26,000 square feet dedicated to amenities and their own spacious outdoor park. A sunroom, lounge, children’s playroom, fitness center, business bar, workspace and local art installations are available throughout the interior. The property’s many outdoor areas include a pool, movie theater, sculpture garden, summer kitchen, and green roof with sky lounge and terrace. The Forge also incorporates wind turbines and a solar power screen for supplemental power. An irrigation system captures rainwater and reuses it on the landscaped green spaces. Bike storage and on-site parking with electric charging stations also support a healthy, green lifestyle. Within The Forge, residents and visitors are welcomed by a 24/7 concierge in an impressive, double-height lobby. The individual Feng Shui-certified residences continue the intended attitude of modern comfort and well being into the studio, one- and two-bedroom units. Delivering on these intentions, the building’s design and construction focuses on sound sensitivity and energy efficiency, as well as environmental responsibility. Prospective tenants seeking to embrace the eco-minded, healthy lifestyle offered by The Forge still have the opportunity to lease a residence. Units currently available are listed as starting at $3,244 for a one-bedroom, one-bath. Linetec is a member of the Aluminum Anodizers Council (AAC), the American Architectural Manufacturers Association (AAMA), the American Institute of Architects (AIA), the Association of Licensed Architects (ALA), the Glass Association of North America (GANA), the U.S. Green Building Council (USGBC) and the Window and Door Manufacturers Association (WDMA). Concrete Plastic Wall Forms feature stay-in-place design. Faux Brick Wall Panels suit indoor and outdoor use. Composite Wall Panels help optimize building performance.